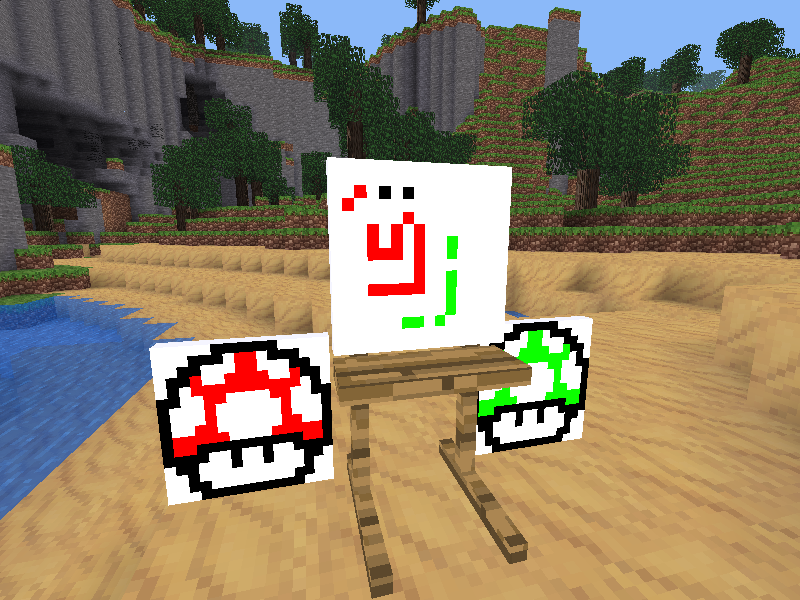 This mod adds in-game painting to minetest. back on the easel and be changed. 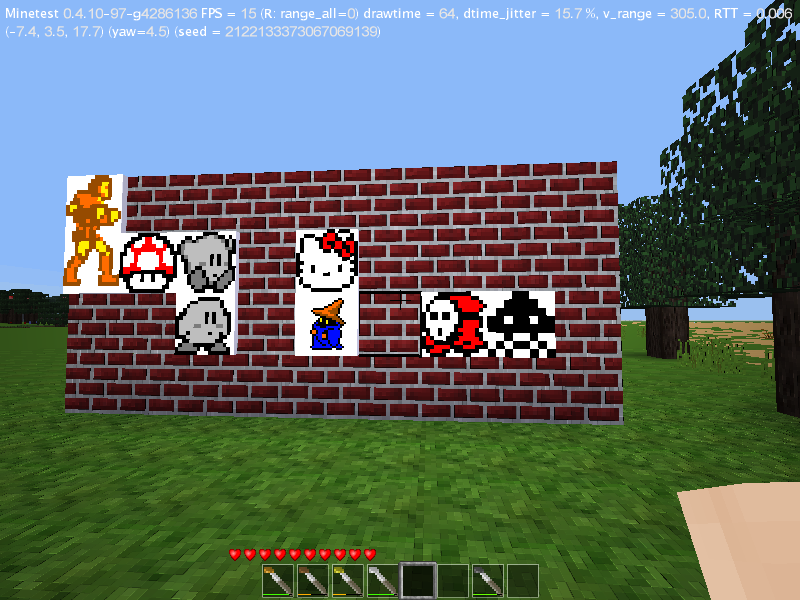 Version 0.7 adds canvases of different sizes: 8, 16, 32 or 64 pixels resolution. Version 0.6 brings more efficiency to the code. pls test and report back. 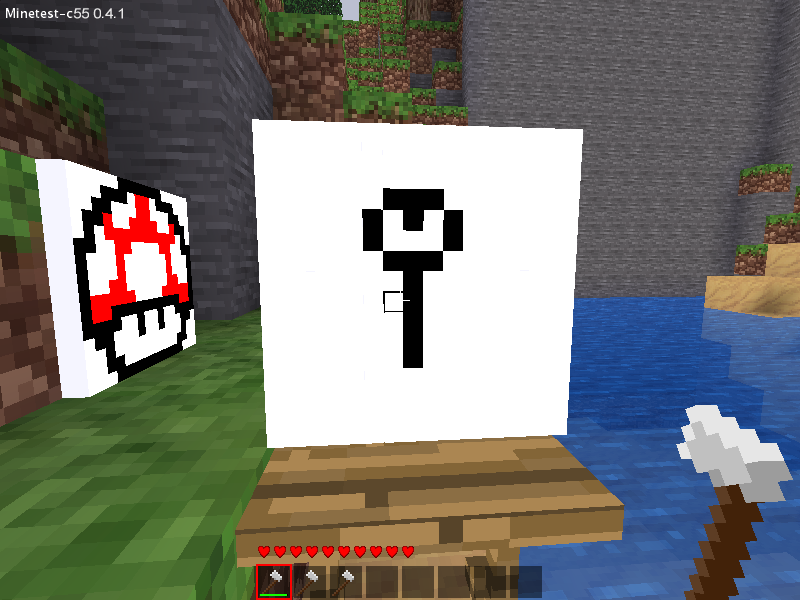 resource friendly as it generates textures instead of relying on entities to draw the pictures. also the licence for the mod has changed, it is now WTFPL. place the easel and hit it while holding a canvas. the canvas will appear on the easel, ready for you to draw. hold a brush and start drawing. when you're finished, dig the canvas, and place your picture. Bugs: if you place two pictures in one node (in a corner) you will lose the first one. Last edited by jin_xi on Mon Dec 23, 2013 17:30, edited 1 time in total. Last edited by rubenwardy on Sat Aug 25, 2012 23:29, edited 1 time in total. No, the map mod uses this recipe. It will cause conflicts. Masteses: i know, but the situation at the moment is that colored wool is in the default game, but not craftable, and painting uses colored wool to craft brushes. This should be updated looks kind of cool. without any request to do so. Last edited by jin_xi on Sat Apr 06, 2013 15:27, edited 1 time in total. I could add some better textures, and make them show in the creative menu. I might have a (possibly outdated) copy of this mod on my old computer, IDK where it is though. That's the difference between subtractive and additive colour mixing. Try this. l don't think that there's no working model. Further down in the answer. I took the liberty to update the links in the first post. Included only xyz's fork and a fork of xyz's fork (yo dawg!) on my account. Didn't include HybridDog's fork because I doubt its legality (he relicensed from GPLv2 to WTFPL [essentially public domain]). IANAL, so please correct me if I'm wrong. Nathan.S, you need to hold shift to draw a line, obviously documentation about painting is missing. l didn't know the problem when placing a painting in a corner, it looks like there needs to be tested if there's air before setting the node, else people with noclip (or modified client) can remove every unprotected node (without or with intention, e.g. bedrock) using that craftitem. And on_destruct instead of after_dig_node should be used at the picture node that the canvas disappears after removing the node. kaeza wrote: […]so please correct me if I'm wrong.